We are glad to be a part of this site! I wanted to take a minute and let you know exactly who we are and what we do. 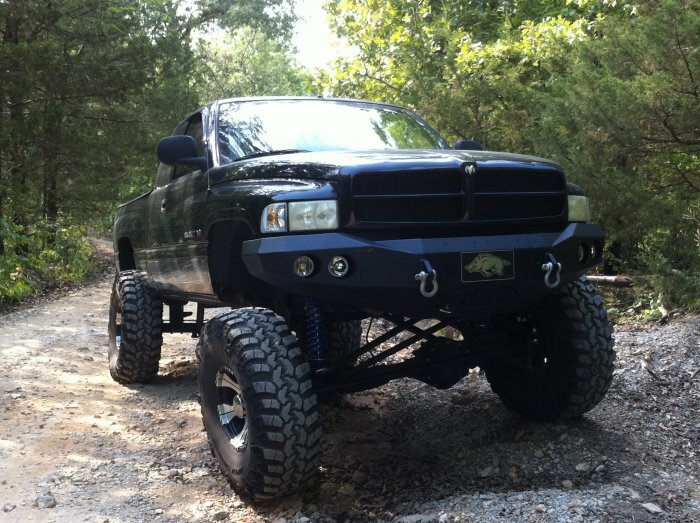 Dodge Off Road was started in 2005, after I had about ten years of experience with Ram trucks. I bought and modified my first Ram in 1994 and it's just been an ongoing thing for me, personally, since then. I have also had (and heavily modified) two 2001s, and a 2004.5. I'm hoping to add a 4th gen to my resume soon. I have also built several Jeeps that were basically used for off-roading only, with a couple of them being in magazines. I have been 4 wheeling all over the country since 1997, and have covered all of the trails in Moab, most of the state of Colorado, as well as various off road parks in my part of the country (Arkansas/Oklahoma/Missouri) and places like the Badlands in Indiana. I helped build a 250-acre off road park and am working on getting another one going in the near future. I mention all of this because I want to make the point that I don't just sell 4x4 parts and build trucks - I use them, and have been using them for quite a long time. I want you guys to feel confident that when I mention a product, it has my seal of approval and that I'm not just trying to sell you something. DOR is a small custom-fab shop that also happens to be one of the largest retailers in the world for several items. We started out with very little and reinvest our profits back into the business to expand the company and the product line. We are not your typical retailer or manufacturer that spends tons of money on advertising - we are more of a grass-roots organization, which is done to keep costs down and prices low. The only way we have grown so much, so quickly, is because of our customers referring their friends. I think this says a lot about how impressed those customers have been. I have always believed in doing things the right way the first time, and that is how the business is run as well. We sell the best products and offer the best customer service possible, not only by answering phone calls/text messages/emails quickly, 7 days a week, but also by having the product knowledge to know what the heck I'm talking about. There are so many retailers out there, and sometimes it is hard for us to be the lowest priced option - but we always beat them out in value because of the technical support. One other thing we do that not many places can, is offer you the option of building your own parts. We have a CNC plasma table that I use to take a customer's drawings or measurements and then cut their items out and ship them right to you. Or if you have an idea but aren't sure how to make it work, we are great at figuring out the details and prototyping something. This side of the business has grown quite a bit recently, as I don't think there are many companies that even have this capability. My email address is djgaston@djgaston.com and you can reach me at 870.404.8975, 7 days a week. If I don't answer, just leave a quick message and I will call you back. Sometimes I can't hear the phone over all of the equipment, or I may be on the other line. Thanks for checking us out! I'll post specific product info in separate threads. I just wanted you guys to know who you are dealing with. I'm just another Ram owner that likes to go 4-wheeling, and I happen to sell some of the best products available for these trucks. My old 3rd gen - 4.5" lift with King 2.5s from Thuren, 37" tires, manual hubs, Thuren steering and track bar, tons of power (too much... I blew it up), hydro assist steering, etc. This is from 2006 - I've been a Thuren customer since he was a Chevy guy! Here is my current truck, which is being turned into an incredibly capable 2nd gen. I'm about halfway there now - just need to finish the rear 4 link/coilovers and then put the Rockwell axles under it. When it's done, the stats will be 2001 V10, long arm/coilovers front and rear, Rockwell 2.5 ton axles with disc brakes and 8 lug conversion, 41" Irok radials, ARB air lockers front and rear, full hydro steering front and rear, Road Rhino bumpers front and rear, etc. Maybe a Power Wagon badge if you guys deem it worthy? Hope to see you all on the trails! Thanks for the idea! I've been contacted by several Ram owners (not just PW owners) about this and the issue I always run into is shipping. I ship my long arm kits via UPS, and while it's expensive, it's manageable. But the sliders are so long that they can't go UPS, so we have to send them on a pallet via freight just like the bumpers. And where people don't mind paying $250 to $300 for shipping a couple of bumpers (since you basically have to have all bumpers shipped), shipping sliders is not as acceptable. I think part of it is that people can have them made locally for less. I would love to corner the market on those sliders but everybody I have talked to so far has backed out when shipping charges come up. That's probably why they were discontinued, and that's why other places that used to make them quit making them. With that said, it looks as if the sliders in the instructions you posted are two pieces in some pictures. And that gives me an idea. This could become a reality if I can shorten the length for shipping, and one way to do that would be to send the long piece of tube in two sections, one sliding into the other and then bolting together. The load would be spread out between two mounts on each one and then shared by the sleeved section, which would be VERY tight. That piece could also be welded together locally. Looking at those brackets, that would be easy. I just need to get a truck here at the shop and mock them up. The other idea I have had in my head is to make the brackets and basically send everything except the long piece, and have a customer source that locally and have it welded to my brackets (which bolt to the frame). But even that will require the truck to be at a shop somewhere for a day, plus having it Line-Xed or powder coated. I'd prefer to do something complete where anybody can install it in their garage or driveway. I had mine shipped from Denver to central AZ via DATS truck freight for $80.00. No pallet, they were just wrapped up and chucked in the truck. That might not work for a painted of powder coated set, but for bare steel, it would be fine. I've never seen a factory set that were built as a two piece, but if they were sleeved properly, I don't see that as an issue. The main tube on a factory set is 0.250 wall, so it would be plenty strong enough to be sleeved. I'm not sure when you had that shipped, but freight prices have gone way up recently, like in the last year. I had a single 41" tire sent to me just wrapped up and thrown in the truck and it was $120. That's with my shipping discount, from Texas to Arkansas. The sleeved section would use another .250" wall DOM piece inside the two main pieces, so you would have a 1/2" thick piece of DOM 1026 there. That should be strong enough! I'm going to see what I can do to get a truck here to mock this up. Nice trucks! I like the 2001 with the 44" boggers. Nice! 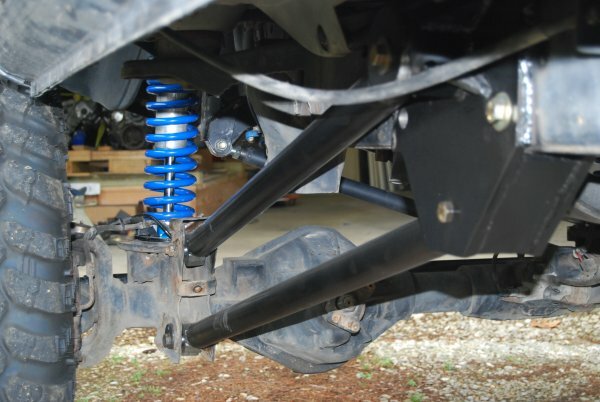 And that's a really nice pic of the Z71's suspension. The 01 Off Roadster was a fun truck but the V10 is a much better platform. It's like Round 2, I'm taking everything I learned from wheeling the blue one and making the black one much better. A healthy V10 with 6.72 gears should satisfy my need for low end power without the turbo lag of a diesel. Thanks again for working to get me setup on here! Don't see it too loud! I'm sure you don't really want to flip a rig! LOL! I've always liked the 2nd Gen Cummins Rams. A friend of mine has one who put two stacks in the bed, beefed up the turbo, chipped, etc. And I like the V10, too. I had the Viper version in my '06 SRT10 Ram SCSB, with a 6spd Tremec. I no longer have it, but it had lots of low end torque. The stick was a pain to drive it in gridlocked traffic on the local highways around here, which Firerescue and Pit know what I'm talking about. Traffic around here during morning and evening rush hour is similar to NYC and north Jersey traffic. Sometimes it feels like I'm in the Truman Show (Jim Carrey movie) when he was trying to get off the island. I'm currently considering a '12 Ram 6.7 Cummings to transform it into a go-fast rig with a Carli Dominator 6" kit, with 3" Kings, 37" Toyos, winch, etc. And I'll use that to tow my PW to GTG. Keep up the good work on that V10. I really like that alot! And how did you do the rear steering?? Is that a kit or something? Yeah, the Magnum V10 is a low-end power house. The torque curve is almost flat which is great for wheeling. The power is constant so you have less wheel spin. That's the only bad thing about the Power Wagons - the car motor. The Hemi likes high RPMs but we need the power down low. Anyway, the last CTD I had was a 6 speed with a dual disc clutch, and going through town or up to Branson was a nightmare. I had muscle spasms in my left leg from using the clutch so much. Lol. I can relate to the gridlock you are talking about. I thought the appeal of a Power Wagon was being able to drive it to and from the trail? The rear steering isn't done yet. I'm building the Rockwells now. Gotta do the rear coilover setup first, then Rockwells, then I will swap the rear axle out for a front axle later and that's when I will have front and rear steering. The full hydro part is a kit from PSC (I sell their stuff) but the rest is simply a front axle put in the back. You operate the rear steering by using a joystick and it has a return to center function. It's pretty simple really, if I had more time I would just go ahead and put the front axle in the rear but I'm doing the build in stages so I want to go the easiest route possible for now. It's hard to make time to work on my own stuff! SOunds like a cool build. Make sure to get lots of pics during the build and create a build thread for it, please! Even though I don't have the means, knowledge or experience, I always like to read through other's builds on how things are done. Sure will! I have a build thread on the DOR forum as well as DTX but I will add one here just for you guys. djgaston wrote: Sure will! I have a build thread on the DOR forum as well as DTX but I will add one here just for you guys.